Today, while talking about Jesus' life, we combined my favorite "sea stories." I realized that I should have started the stories of Jesus at the beginning of the month. There are so many great stories!! So to fit a little more in, I combined my favorite three stories. They are when Jesus told Simon to cast his net into the sea. Simon told Jesus that they had been fishing ALL NIGHT and hadn't caught a single fish. He cast his net in and pull up enough fish to fill TWO boats!! The second story is when Christ and his disciples were on the stormy sea. They were frightened and afraid. They woke up the Savior to explain their fears. He asked they why they had so little faith. He rebuked the winds and the sea became calm. Even his disciples were astonished. It made me think a little. Why didn't they have faith in Him? They were His disciples. Then I remembered that they didn't have the scriptures to tell them all about His great power. They didn't have the examples of His life. I learned "more!" I learned how GRATEFUL I am for the scriptures! The third story I shared was when Christ walked on the water. The thing that really struck me this time was Peter's part of the story. When the apostles saw Christ walking on the water, they first thought it was a ghost. He called out to them to not be afraid, it was Him. Peter then called, (I paraphrasing of course.) "If i t is you, then ask me to come to you." Peter then gets out of the boat and he WALKS ON THE WATER. Folks, he really did it!! This is the part that struck me this time. Even when I googled images to find one for this post of Peter walking on water, there were only two with him actually walking on the water. The other one was of black Jesus and black Peter. Yet there were hundreds of different images of Peter falling into the water. Including a really awesome Lego one. No one really remembers that Peter really DID it!! 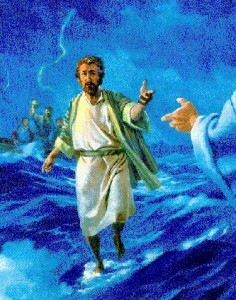 Now the story is true, Peter was out on the water, walking towards the Savior, and he got scared. Peter looked at the circumstances. Instead of focusing on the fact that Peter was doing it, and that he was headed toward the Savior, he started noticing that the wind was pretty crazy. Instead of thinking, Hey, I am doing this even with the crazy wind, he doubted. How many times in our lives do we not focus on our successes, but focus on all the reasons why we should fail? You mean it is just me? I do it all the time.